InSpec is an open-source, automated testing framework for testing and auditing your system to ensure the compliance of integration, security, and other policy requirements. Developers can test the actual state of their infrastructure and applications against a target state using InSpec code. To specify the policy requirements you’re testing for, InSpec includes audit controls. Traditionally, developers manually enforce policy requirements and often do this right before deploying changes to production. With InSpec however, developers can continuously evaluate compliance at every stage of product development, which aids in solving issues earlier in the process of development. The InSpec DSL (Domain Specific Language) built on RSpec, a DSL testing tool written in Ruby, specifies the syntax used to write the audit controls. InSpec also includes a collection of resources to assist in configuring specific parts of your system and to simplify making audit controls. There is a feature to write your own custom resources when you need to define a specific solution that isn’t available. Universal matchers allow you to compare resource values to expectations across all InSpec tests. In this tutorial, you’ll install InSpec on a server running Ubuntu 18.04. You will start by writing a test that verifies the operating system family of the server, then you’ll create a PostgreSQL audit profile from the ground up. This audit profile starts by checking that you have PostgreSQL installed on the server and that its services are running. Then you’ll add tests to check that the PostgreSQL service is running with the correct port, address, protocol, and user. Next you’ll test specific PostgreSQL configuration parameters, and finally, you’ll audit client authentication configuration. In this step, you’ll download and unpack the latest stable version of InSpec into your home directory. InSpec provides installable binaries on their downloads page. Next, use the sha256sum command to generate a checksum of the downloaded file. This is to verify the integrity and authenticity of the downloaded file. Checksums for each binary are listed on the InSpec downloads page, so visit the downloads page to compare with your output from this command. If the checksums are different, delete the downloaded file and repeat the download process. Next, you'll install the downloaded binary. For this, you'll use the dpkg command that you can use for package management, and which comes with all Debian-based systems, such as Ubuntu, by default. The -i flag prompts the dpkg command to install the package files. If you don't see a version number displayed, run over step 1 again. You've successfully installed InSpec on your server. In the next step, you will write a test to verify the operating system family of your server. In this step, you'll complete your first InSpec test, which will be testing that your operating system family is debian. You will use the os resource, which is a built-in InSpec audit resource to test the platform on which the system is running. You'll also use the eq matcher. The eq matcher is a universal matcher that tests for the exact equality of two values. An InSpec test consists of a describe block, which contains one or more it and its statements each of which validates one of the resource's features. Each statement describes an expectation of a specific condition of the system as assertions. Two keywords that you can include to make an assertion are should and should_not, which assert that the condition should be true and false respectively. This test ensures that the operating system family of the target system is debian. Other possible values are windows, unix, bsd, and so on. You can find a complete list in the os resource documentation. Save and exit the file. In your output, the Profile contains the name of the profile that just executed. Since this test is not included in a profile, InSpec generates a default profile name from the test's file name tests from os_family.rb. (You'll work with InSpec profiles in the next section where you will start building your PostgreSQL InSpec profile.) Here InSpec presents the Version as not specified, because you can only specify versions in profiles. The Target field specifies the target system that the test is executed on, which can be local or a remote system via ssh. In this case, you've executed your test on the local system so the target shows local://. Usefully, the output also displays the executed test with a checkmark symbol (✔) to the left indicating a successful test. The output will show a cross symbol (✘) if the test fails. Finally, the test summary gives overall details about how many tests were successful, failed, and skipped. In this instance, you had a single successful test. As expected, the test failed. The output indicates that your expected (windows) and actual (debian) values do not match for the os.family property. The (compared using ==) output indicates that the eq matcher performed a string comparison between the two values to come up with this result. In this step, you've written a successful test that verifies the operating system family of the server. You've also created a failed test in order to see what the InSpec output for a failed test looks like. In the next step, you will start building the audit profile to test your PostgreSQL installation. Now, you will audit your PostgreSQL installation. You'll start by checking that you have PostgreSQL installed and its service is running correctly. Finally, you'll audit the PostgreSQL system port and process. For your PostgreSQL audit, you will create various InSpec controls, all within an InSpec profile named PostgreSQL. An InSpec control is a high-level grouping of related tests. Within a control, you can have multiple describe blocks, as well as metadata to describe your tests such as impact level, title, description, and tags. InSpec profiles organize controls to support dependency management and code reuse, which both help manage test complexity. They are also useful for packaging and sharing tests with the public via the Chef Supermarket. You can use profiles to define custom resources that you would implement as regular Ruby classes. The controls/example.rb file contains a sample control that tests to see if the /tmp folder exists on the target system. This is present only as a sample and you will replace it with your own test. Your first test will be to ensure that you have the package postgresql-10 installed on your system and that you have the postgresql service installed, enabled, and running. In the preceding code block, you begin by defining the control with its name and metadata. In the first describe block, you use the package resource and pass in the PostgreSQL package name postgresql-10 as a resource argument. The package resource provides the matcher be_installed to test that the named package is installed on the system. It returns true if you have the package installed, and false otherwise. Next, you used the its statement to validate that the version of the installed PostgreSQL package is at least 10. You are using cmp instead of eq because package version strings usually contain other attributes apart from the numerical version. eq returns true only if there is an exact match while cmp is less-restrictive. In the second describe block, you use the service resource and pass in the PostgreSQL 10 service name postgresql@10-main as a resource argument. The service resource provides the matchers be_enabled, be_installed, and be_running and they return true if you have the named service installed, enabled, and running on the target system respectively. Save and exit your file. ✔  System Package postgresql-10 version should cmp >= "10"
The output indicates that your control was successful. A control is successful if, and only if, all the tests in it are successful. The output also confirms that all your tests were successful. Now that you've verified that the correct version of PostgreSQL is installed and the service is fine, you will create a new control that ensures that PostgreSQL is listening on the correct port, address, and protocol. For this test, you will also use attributes. An InSpec attribute is used to parameterize a profile to enable easy re-use in different environments or target systems. You'll define the PORT attribute. In the preceding code block, you added the port attribute and set it to a default value of 5432 because that is the port PostgreSQL listens on by default. If there are no errors, you can proceed. Otherwise, open the inspec.yml file and ensure that the attribute is present at the end of the file. Here you begin by declaring a PORT variable to hold the value of the port profile attribute. Then you declare the control and its metadata. In the first describe block, you include the port resource to test basic port properties. The port resource provides the matchers be_listening, addresses, and protocols. You use the be_listening matcher to test that the named port is listening on the target system. It returns true if the port 5432 is listening and returns false otherwise. The addresses matcher tests if the specified address is associated with the port. In this case, PostgreSQL will be listening on the local address, 127.0.0.1. The protocols matcher tests the Internet protocol the port is listening for, which can be icmp, tcp/tcp6, or udp/udp6. PostgreSQL will be listening for tcp connections. In the second describe block, you include the processes resource. You use the processes resource to test properties for programs that are running on the system. First, you verify that the postgres process exists on the system, then you use the users matcher to test that the postgres user owns the postgres process. In the third describe block, you have the user resource. You include the user resource to test user properties for a user such as whether the user exists or not, the group the user belongs to, and so on. Using this resource, you test that the postgres user exists on the system. Save and exit controls/postgresql.rb. ✔  Port 5432 addresses should include "127.0.0.1"
✔  Port 5432 protocols should cmp == "tcp"
✔  Processes postgres users should include "postgres"
The output indicates that both of your controls and all of your tests were successful. In this section, you have created your first InSpec profile and control and used them to organize your tests. You've used several InSpec resources to ensure that you have the correct version of PostgreSQL installed, the PostgreSQL service enabled and running correctly, and that the PostgreSQL user exists on the system. With this set up you're ready to audit your configuration. In this step, you'll audit some PostgreSQL configuration values, which will give you a foundation for working with these configuration files, allowing you to audit any PostgreSQL configuration parameters as desired. Now that you have tests auditing the PostgreSQL installation, you'll audit your PostgreSQL configuration itself. PostgreSQL has several configuration parameters that you can use to tune it as desired, and these are stored in the configuration file located by default at /etc/postgresql/10/main/postgresql.conf. You could have different requirements regarding PostgreSQL configuration for your various deployments such as logging, password encryption, SSL, and replication strategies — these requirements you specify in the configuration file. You will be using the postgres_conf resource that tests for specific, named configuration options against expected values in the contents of the PostgreSQL configuration file. This test will assume some non-default PostgreSQL configuration values that you'll set manually. Ensure that saved passwords are always encrypted with the scram-sha-256 algorithm. Enable the logging collector, which is a background process that captures log messages from the standard error (stderr) and redirects them to a log file. Enable logging of connection attempts to the PostgreSQL server as well as successful connections. Enable logging of session terminations. Enable logging of the duration of every completed statement. You'll test for only a few configuration options, but you can test any PostgreSQL configuration option with the postgres_conf resource. You will pass in your PostgreSQL configuration directory, which is at /etc/postgresql/10/main, using a new profile attribute, postgres_conf_dir. This configuration directory is not the same across all operating systems and platforms, so by passing it in as a profile attribute, you'll be making this profile easier to reuse in different environments. If there are no errors, you can proceed. Otherwise, open the inspec.yml file and ensure that the above lines are present at the end of the file. POSTGRES_CONF_DIR holds the postgres_conf_dir attribute as defined in the profile configuration. POSTGRES_CONF_PATH holds the absolute path of the configuration file by concatenating the configuration file name with the configuration directory using File.join. Next, you define the control with its name and metadata. Then you use the postgres_conf resource together with the eq matcher to ensure your required values for the configuration options are correct. Save and exit controls/postgresql.rb. ✔  PostgreSQL Configuration port should eq "5432"
✔  PostgreSQL Configuration password_encryption should eq "scram-sha-256"
✔  PostgreSQL Configuration ssl should eq "on"
✔  PostgreSQL Configuration logging_collector should eq "on"
✔  PostgreSQL Configuration log_connections should eq "on"
✔  PostgreSQL Configuration log_disconnections should eq "on"
✔  PostgreSQL Configuration log_duration should eq "on"
The output indicates that your three controls and all your tests were successful without any skipped tests or controls. In this step, you've added a new InSpec control that tests specific PostgreSQL configuration values from the configuration file using the postgres_conf resource. You audited a few values in this section, but you can use it to test any configuration option from the configuration file. Now that you've written some tests for your PostgreSQL configuration, you'll write some tests for client authentication. This is important for installations that need to ensure specific authentication methods for different kinds of users; for example, to ensure clients connecting to PostgreSQL locally always need to authenticate with a password, or to reject connections from a specific IP address or IP address range, and so on. An important configuration for PostgreSQL installations where security is a concern is to only allow encrypted password authentications. PostgreSQL 10 supports two password encryption methods for client authentication: md5 and scram-sha-256. This test will require password encryption for all clients so this means that the METHOD field for all clients in the client configuration file must be set to either md5 or scram-sha-256. For these tests, you will use scram-sha-256 since it is more secure than md5. For this test, you'll use the postgres_hba_conf resource. This resource is used to test the client authentication data defined in the pg_hba.conf file. You'll pass in the path of your pg_hba.conf file as a parameter to this resource. In this code block, you define a new variable POSTGRES_HBA_CONF_FILE to store the absolute location of your pg_hba.conf file. File.join is a Ruby method to concatenate two file path segments with /. You use it here to join the POSTGRES_CONF_DIR variable, declared in the previous section, with the PostgreSQL configuration file pg_hba.conf. This will produce an absolute file path of the pg_hba.conf file and store it in the POSTGRES_HBA_CONF_FILE variable. After that, you declare and configure the control and its metadata. The first describe block checks that all configuration entries where the client type is local also have scram-sha-256 as their authentication methods. The second describe block does the same for cases where the client type is host. Save and exit controls/postgresql.rb. sudo -u postgres inspec exec . ✔  Postgres Hba Config /etc/postgresql/10/main/pg_hba.conf with type == "local" auth_method should all eq "scram-sha-256"
✔  Postgres Hba Config /etc/postgresql/10/main/pg_hba.conf with type == "host" auth_method should all eq "scram-sha-256"
This output indicates that the new control you added, together with all of the previous controls, are successful. It also indicates that all the tests in your profile are successful. In this step, you have added a control to your profile that successfully audited your PostgreSQL client authentication configuration to ensure that all clients are authenticated via scram-sha-256 using the postgres_hba_conf resource. You've set up InSpec and successfully audited a PostgreSQL 10 installation. In the process, you've used a selection of InSpec tools, such as: the InSpec DSL, matchers, resources, profiles, attributes, and the CLI. 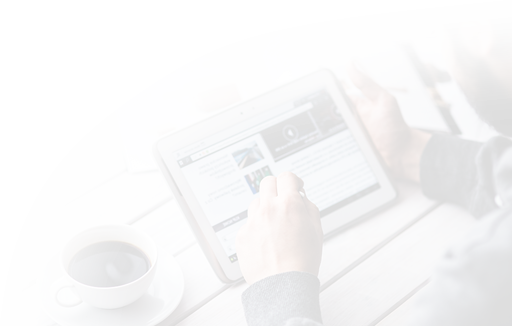 From here, you can incorporate other resources that InSpec provides in the Resources section of their documentation. InSpec also provides a mechanism for defining custom resources for your specific needs. These custom resources are written as a regular Ruby class. You can also explore the Compliance Profiles section of the Chef supermarket that contains publicly shared InSpec profiles that you can execute directly or extend in your own profiles. You can also share your own profiles with the general public in the Chef Supermarket. You can go further by exploring other tools in the Chef universe such as Chef and Habitat. InSpec is integrated with Habitat and this provides the ability to ship your compliance controls together with your Habitat-packaged applications and continuously run them. You can explore official and community InSpec tutorials on the tutorials page. For more advanced InSpec references, check the official InSpec documentation. DigitalOcean Managed Databases allows you to scale your PostgreSQL database using several methods. One such method is a built-in connection pooler that allows you to efficiently handle large numbers of client connections and reduce the CPU and memory footprint of these open connections. By using a connection pool and sharing a fixed set of recyclable connections, you can handle significantly more concurrent client connections, and squeeze extra performance out of your PostgreSQL database. In this tutorial we’ll use pgbench, PostgreSQL’s built-in benchmarking tool, to run load tests on a DigitalOcean Managed PostgreSQL Database. We’ll dive in to connection pools, describe how they work, and show how to create one using the Cloud Control panel. Finally, using results from the pgbench tests, we’ll demonstrate how using a connection pool can be an inexpensive method of increasing database throughput. A DigitalOcean Managed PostgreSQL Database cluster. To learn how to provision and configure a DigitalOcean PostgreSQL cluster, consult the Managed Database product documentation. A client machine with PostgreSQL installed. By default, your PostgreSQL installation will contain the pgbench benchmarking utility and the psql client, both of which we’ll use in this guide. Consult How To Install and Use PostgreSQL on Ubuntu 18.04 to learn how to Install PostgreSQL. If you’re not running Ubuntu on your client machine, you can use the version finder to find the appropriate tutorial. Once you have a DigitalOcean PostgreSQL cluster up and running and a client machine with pgbench installed, you’re ready to begin with this guide. Before we create a connection pool for our database, we’ll first create the benchmark database on our PostgreSQL cluster and populate it with some dummy data on which pgbench will run its tests. The pgbench utility repeatedly runs a series of five SQL commands (consisting of SELECT, UPDATE, and INSERT queries) in a transaction, using multiple threads and clients, and calculates a useful performance metric called Transactions per Second (TPS). TPS is a measure of database throughput, counting the number of atomic transactions processed by the database in one second. To learn more about the specific commands executed by pgbench, consult What is the “Transaction” Actually Performed in pgbench? from the official pgbench documentation. Let’s begin by connecting to our PostgreSQL cluster and creating the benchmark database. Take note of these parameters, as you’ll need them when using both the psql client and pgbench tool. Click on the dropdown above this box and select Connection String. We’ll copy this string and pass it in to psql to connect to this PostgreSQL node. Before we run the pgbench tests, we need to populate this benchmark database with some tables and dummy data required to run the tests. -i: Indicates that we'd like to initialize the benchmark database with benchmarking tables and their dummy data. Using a scale factor of 150, the pgbench_accounts table will contain 15,000,000 rows. Note: To avoid excessive blocked transactions, be sure to set the scale factor to a value at least as large as the number of concurrent clients you intend to test with. In this tutorial we'll test with 150 clients at most, so we set -s to 150 here. To learn more, consult these recommended practices from the official pgbench documentation. After running this command, you will be prompted to enter the password for the database user you specified. Enter the password, and hit ENTER. At this point, we've created a benchmarking database, populated with the tables and data required to run the pgbench tests. We can now move on to running a baseline test which we'll use to compare performance before and after connection pooling is enabled. Before we run our first benchmark, it's worth diving into what we're trying to optimize with connection pools. Typically when a client connects to a PostgreSQL database, the main PostgreSQL OS process forks itself into a child process corresponding to this new connection. When there are only a few connections, this rarely presents an issue. However, as clients and connections scale, the CPU and memory overhead of creating and maintaining these connections begins to add up, especially if the application in question does not efficiently use database connections. In addition, the max_connections PostgreSQL setting may limit the number of client connections allowed, resulting in additional connections being refused or dropped. A connection pool keeps open a fixed number of database connections, the pool size, which it then uses to distribute and execute client requests. This means that you can accommodate far more simultaneous connections, efficiently deal with idle or stagnant clients, as well as queue up client requests during traffic spikes instead of rejecting them. By recycling connections, you can more efficiently use your machine's resources in an environment where there is a heavy connection volume, and squeeze extra performance out of your database. A connection pool can be implemented either on the application side or as middleware between the database and your application. 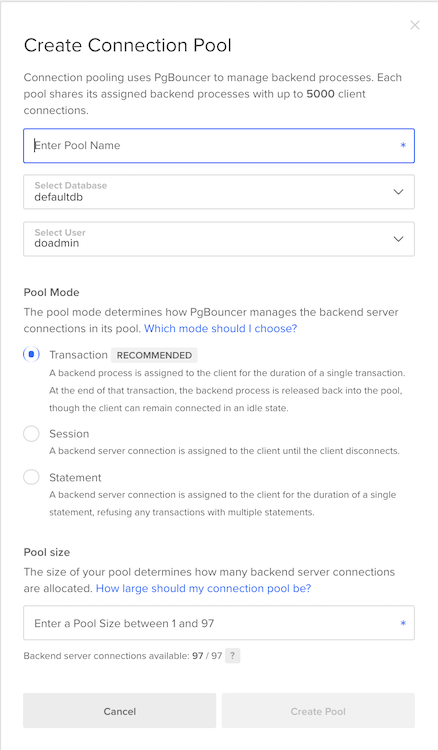 The Managed Databases connection pooler is built on top of pgBouncer, a lightweight, open-source middleware connection pooler for PostgreSQL. Its interface is available via the Cloud Control Panel UI. Mode: One of Session, Transaction, or Statement. This option controls how long the pool assigns a backend connection to a client. Session: The client holds on to the connection until it explicitly disconnects. Transaction: The client obtains the connection until it completes a transaction, after which the connection is returned to the pool. Statement: The pool aggressively recycles connections after each client statement. In statement mode, multi-statement transactions are not allowed. To learn more, consult the Connection Pools product documentation. Pool Size: The number of connections the connection pool will keep open between itself and the database. Before we create a connection pool, we'll run a baseline test to which we can compare database performance with connection pooling. In this tutorial, we'll use a 4 GB RAM, 2 vCPU, 80 GB Disk, primary node only Managed Database setup. You can scale the benchmark test parameters in this section according to your PostgreSQL cluster specs. DigitalOcean Managed Database clusters have the PostgreSQL max_connections parameter preset to 25 connections per 1 GB RAM. A 4 GB RAM PostgreSQL node therefore has max_connections set to 100. In addition, for all clusters, 3 connections are reserved for maintenance. So for this 4 GB RAM PostgreSQL cluster, 97 connections are available for connection pooling. With this in mind, let's run our first baseline pgbench test. -c: The number of concurrent clients or database sessions to simulate. We set this to 50 so as to simulate a number of concurrent connections smaller than the max_connections parameter for our PostgreSQL cluster. -j: The number of worker threads pgbench will use to run the benchmark. If you're using a multi-CPU machine, you can tune this upwards to distribute clients across threads. On a two-core machine, we set this to 2. -P: Display progress and metrics every 60 seconds. -T: Run the benchmark for 600 seconds (10 minutes). To produce consistent, reproducible results, it's important that you run the benchmark for several minutes, or through one checkpoint cycle. We’ll also specify that we'd like to run the benchmark against the benchmark database we created and populated earlier. Here, we observed that over a 10 minute run with 50 concurrent sessions, we processed 105,256 transactions with a throughput of roughly 175 transactions per second. Note the FATAL error, indicating that pgbench hit the 100 connection limit threshold set by max_connections, resulting in a refused connection. The test was still able to complete, with a TPS of roughly 257. At this point we can investigate how a connection pool could potentially improve our database's throughput. In this step we'll create a connection pool and rerun the previous pgbench test to see if we can improve our database's throughput. In general, the max_connections setting and connection pool parameters are tuned in tandem to max out the database's load. However, because max_connections is abstracted away from the user in DigitalOcean Managed Databases, our main levers here are the connection pool Mode and Size settings. To begin, let's create a connection pool in Transaction mode that keeps open all the available backend connections. Navigate to Databases in the Control Panel, and then click into your PostgreSQL cluster. From here, click into Connection Pools. Then, click on Create a Connection Pool. Here we name our connection pool test-pool, and use it with the benchmark database. Our database user is doadmin and we set the connection pool to Transaction mode. Recall from earlier that for a managed database cluster with 4GB of RAM, there are 97 available database connections. Accordingly, configure the pool to keep open 97 database connections. When you're done, hit Create Pool. You should notice a different port here, and potentially a different endpoint and database name, corresponding to the pool name test-pool. Now that we've created the test-pool connection pool, we can rerun the pgbench test we ran above. Here we once again use 150 concurrent clients, run the test across 2 threads, print progress every 60 seconds, and run the test for 600 seconds. We set the database name to test-pool, the name of the connection pool. Notice here that we were able to increase our database's throughput from 257 TPS to 344 TPS with 150 concurrent connections (an increase of 33%), and did not run up against the max_connections limit we previously hit without a connection pool. By placing a connection pool in front of the database, we can avoid dropped connections and significantly increase database throughput in an environment with a large number of simultaneous connections. Here we see that we were not able to increase throughput by using a connection pool. Our throughput went down to 171 TPS from 175 TPS. 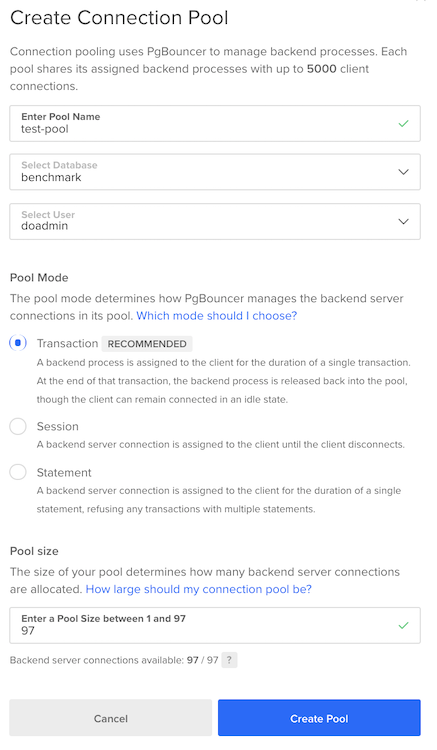 Although in this guide we use pgbench with its built-in benchmark data set, the best test for determining whether or not to use a connection pool is a benchmark load that accurately represents production load on your database, against production data. Creating custom benchmarking scripts and data is beyond the scope of this guide, but to learn more, consult the official pgbench documentation. Note: The pool size setting is highly workload-specific. In this guide, we configured the connection pool to use all the available backend database connections. This was because throughout our benchmark, the database rarely reached full utilization (you can monitor database load from the Metrics tab in the Cloud Control Panel). Depending on your database's load, this may not be the optimal setting. If you notice that your database is constantly fully saturated, shrinking the connection pool may increase throughput and improve performance by queuing additional requests instead of trying to execute them all at the same time on an already loaded server. DigitalOcean Managed Databases connection pooling is a powerful feature that can help you quickly squeeze extra performance out of your database. Along with other techniques like replication, caching, and sharding, connection pooling can help you scale your database layer to process an even greater volume of requests. In this guide we focused on a simplistic and synthetic testing scenario using PostgreSQL's built-in pgbench benchmarking tool and its default benchmark test. In any production scenario, you should run benchmarks against actual production data while simulating production load. This will allow you to tune your database for your particular usage pattern. Along with pgbench, other tools exist to benchmark and load your database. One such tool developed by Percona is sysbench-tpcc. Another is Apache's JMeter, which can load test databases as well as web applications. To learn more about DigitalOcean Managed Databases, consult the Managed Databases product documentation. To learn more about sharding, another useful scaling technique, consult Understanding Database Sharding. Databases are a key component of many websites and applications, and are at the core of how data is stored and exchanged across the internet. One of the most important aspects of database management is the practice of retrieving data from a database, whether it’s on an ad hoc basis or part of a process that’s been coded into an application. There are several ways to retrieve information from a database, but one of the most commonly-used methods is performed through submitting queries through the command line. In relational database management systems, a query is any command used to retrieve data from a table. In Structured Query Language (SQL), queries are almost always made using the SELECT statement. In this guide, we will discuss the basic syntax of SQL queries as well as some of the more commonly-employed functions and operators. We will also practice making SQL queries using some sample data in a PostgreSQL database. PostgreSQL, often shortened to “Postgres,” is a relational database management system with an object-oriented approach, meaning that information can be represented as objects or classes in PostgreSQL schemas. PostgreSQL aligns closely with standard SQL, although it also includes some features not found in other relational database systems. With this setup in place, we can begin the tutorial. Before we can begin making queries in SQL, we will first create a database and a couple tables, then populate these tables with some sample data. This will allow you to gain some hands-on experience when you begin making queries later on. You and several of your friends all celebrate your birthdays with one another. On each occasion, the members of the group head to the local bowling alley, participate in a friendly tournament, and then everyone heads to your place where you prepare the birthday-person’s favorite meal. Now that this tradition has been going on for a while, you’ve decided to begin tracking the records from these tournaments. Also, to make planning dinners easier, you decide to create a record of your friends’ birthdays and their favorite entrees, sides, and desserts. Rather than keep this information in a physical ledger, you decide to exercise your database skills by recording it in a PostgreSQL database. Once that command completes successfully, you're done setting up your database. Next, we'll go over the basic command structure of SELECT queries. As mentioned in the introduction, SQL queries almost always begin with the SELECT statement. SELECT is used in queries to specify which columns from a table should be returned in the result-set. Queries also almost always include FROM, which is used to specify which table the statement will query. Based on the output above, we see that the entree we have forgotten is tofu. Here, we have told SQL to display the name column as n, the birthdate column as b, and the dessert column as d.
The examples we've gone through up to this point include some of the more frequently-used keywords and clauses in SQL queries. These are useful for basic queries, but they aren't helpful if you're trying to perform a calculation or derive a scalar value (a single value, as opposed to a set of multiple different values) based on your data. This is where aggregate functions come into play. Oftentimes, when working with data, you don't necessarily want to see the data itself. Rather, you want information about the data. The SQL syntax includes a number of functions that allow you to interpret or run calculations on your data just by issuing a SELECT query. These are known as aggregate functions. HINT:  No function matches the given name and argument types. You might need to add explicit type casts. Aggregate functions have many uses beyond what was described in this section. They're particularly useful when used with the GROUP BY clause, which is covered in the next section along with several other query clauses that affect how result-sets are sorted. In addition to the FROM and WHERE clauses, there are several other clauses which are used to manipulate the results of a SELECT query. In this section, we will explain and provide examples for some of the more commonly-used query clauses. One of the most frequently-used query clauses, aside from FROM and WHERE, is the GROUP BY clause. It's typically used when you're performing an aggregate function on one column, but in relation to matching values in another. The HAVING clause was added to SQL to provide functionality similar to that of the WHERE clause while also being compatible with aggregate functions. It's helpful to think of the difference between these two clauses as being that WHERE applies to individual records, while HAVING applies to group records. To this end, any time you issue a HAVING clause, the GROUP BY clause must also be present. Aggregate functions are useful for summarizing the results of a particular column in a given table. However, there are many cases where it's necessary to query the contents of more than one table. We'll go over a few ways you can do this in the next section. More often than not, a database contains multiple tables, each holding different sets of data. SQL provides a few different ways to run a single query on multiple tables. The JOIN clause can be used to combine rows from two or more tables in a query result. It does this by finding a related column between the tables and sorts the results appropriately in the output. Note that because JOIN clauses compare the contents of more than one table, the previous example specifies which table to select each column from by preceding the name of the column with the name of the table and a period. You can specify which table a column should be selected from like this for any query, although it's not necessary when selecting from a single table, as we've done in the previous sections. Let's walk through an example using our sample data. Notice that, because the tourneys table has no entry for Lesley and the dinners table has no entry for Bettye, those records are absent from this output. It is possible, though, to return all the records from one of the tables using an outer JOIN clause. Outer JOIN clauses are written as either LEFT JOIN, RIGHT JOIN, or FULL JOIN. A LEFT JOIN clause returns all the records from the “left” table and only the matching records from the right table. In the context of outer joins, the left table is the one referenced by the FROM clause, and the right table is any other table referenced after the JOIN statement. Note that left and right joins can be written as LEFT OUTER JOIN or RIGHT OUTER JOIN, although the OUTER part of the clause is implied. Likewise, specifying INNER JOIN will produce the same result as just writing JOIN. Note: As of this writing, the FULL JOIN clause is not supported by either MySQL or MariaDB. As an alternative to using FULL JOIN to query all the records from multiple tables, you can use the UNION clause. The UNION operator works slightly differently than a JOIN clause: instead of printing results from multiple tables as unique columns using a single SELECT statement, UNION combines the results of two SELECT statements into a single column. Another way to query multiple tables is through the use of subqueries. Subqueries (also known as inner or nested queries) are queries enclosed within another query. These are useful in cases where you're trying to filter the results of a query against the result of a separate aggregate function. The subquery in this statement was run only once; it only needed to find the value from the wins column in the same row as Barbara in the name column, and the data returned by the subquery and outer query are independent of one another. There are cases, though, where the outer query must first read every row in a table and compare those values against the data returned by the subquery in order to return the desired data. In this case, the subquery is referred to as a correlated subquery. Notice that this statement not only includes a subquery, but also contains a subquery within that subquery. Issuing queries is one of the most commonly-performed tasks within the realm of database management. There are a number of database administration tools, such as phpMyAdmin or pgAdmin, that allow you to perform queries and visualize the results, but issuing SELECT statements from the command line is still a widely-practiced workflow that can also provide you with greater control.